Free Printable Dear Santa Letter. 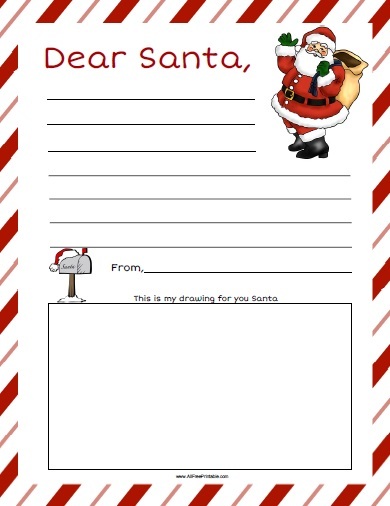 Free Printable Dear Santa Letter, great for kids this Christmas. Kids can use this Dear Santa Letter to write down what they want for Christmas or a special message to Santa Claus. Print the Dear Santa Letter using your inkjet or laser printer. The Dear Santa Letter includes enough space to write kids message, a candy cane border, Santa Claus and mail box. Also includes a boxed space at the bottom for kids to make a drawing for Santa Claus if they want, with a message at the top “This is my drawing for you Santa”. Download the Dear Santa Letter in PDF format and share with kids this Holidays.